I am finally on pattern #2 for Twizzler! Hurrah! In fact, I am halfway through the first repeat. This pattern is far simpler than the first and I am zooming though it. This pattern is a multiple of 6 stitches instead of 14. In regards to Challenge #3 for the Amazing Lace, I am slightly stumped. I need to write a poem devoted to Twizzler and I can't seem to think of something. Maybe something will pop into my mind while doing mindless data entry at work. This past weekend was an interesting one for knitting projects. I decided to frog a few that I felt that I would never ever finish. I frogged the purse I started over a year ago and the second pink hat I was knitting. I feel relieved. Now I just have Branching Out, Twizzler, Sock (and Second Sock), the turtle, checkered grey scarf, a dishcloth, and a fun fur scarf. I am planning on finishing Branching Out and the dishcloth and then working on the other UFOs. Oh, did I forget to mention that I am knitting a swatch for the Mystery Stole 2006 KAL? I haven't gotten too far. I am starting row 3 of 30. I am exciting about this KAL, but this is the first time I have knit with lace weight yarn and it is like dental floss! I am at a complete loss for how tiny and skinny this yarn is! The first pattern is going to be given to us on July 7th and so I need to get my act together and finish this swatch. I finished The Lovely Bones this weekend. I enjoyed it, but it is a sad tale, so I was left with almost a bittersweet enjoyment of the book. I am going to pull out a new book out of my suitcase of books tonight. I wonder what I am going to get this time! 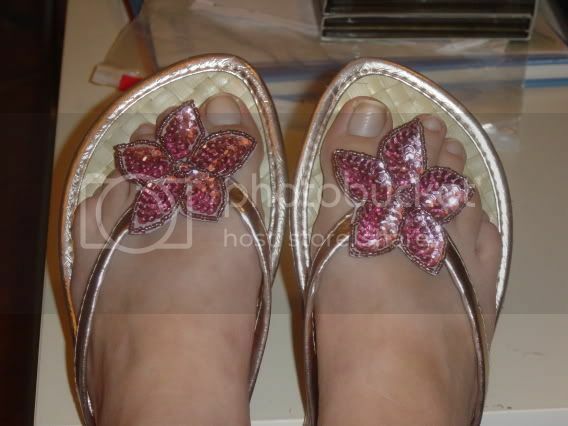 I know this is random, but look at my cute sandal purchase! Florida here I come!